Remember how I told you I would have a post that makes this one obsolete? Here it is. 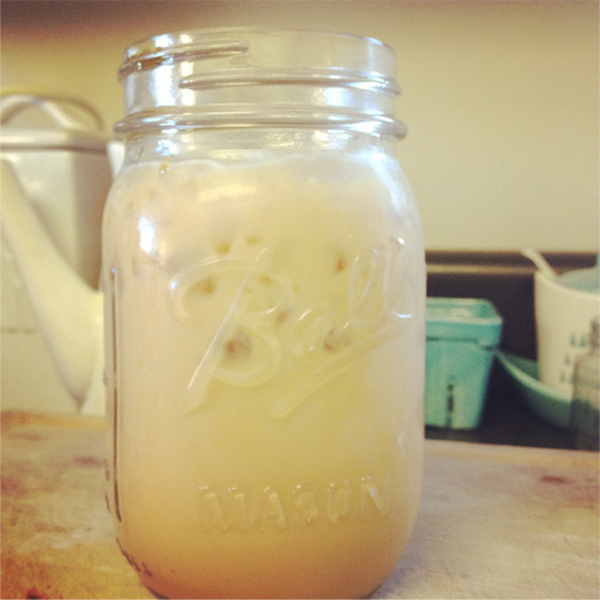 The perfect iced coffee recipe. It's not so much a recipe as it is a recommendation for a product you HAVE to have to make the best iced coffee ever, well, that and some really good beans. And no, I was in no way paid for this recommendation but that would be nice Toddy people. Anyway, when I originally posted about my trials with making an iced coffee, I really wanted something I could make in batches that I could just pull out of the refrigerator as needed. It may sound lazy but I didn't want to brew hot coffee and wait for it to cool in the refrigerator. I wanted it when I needed it. So I tried some recipes I found online and wrote that post about it. Then a lovely friend (thanks, Krista!) left me a comment about how she uses a Toddy Cold Brew Coffee Maker . Yes, a Toddy . Don't worry, I had to google it too. Several months went by and I found myself in a local coffee shop (with my mom) talking to a very helpful lady about the best coffee to brew for iced coffee concentrate. She directed me to the Toddy as well. Hmm. I thought. There must really be something to this thing they call Toddy . I jokingly made the comment to my mom to put it on my Christmas list (I mean hello, do you remember what happens when I make jokes about Christmas gifts - *ahem* alphabet cabinet *thanks dad*). We left the store and months went by. Then Starbucks comes out with their iced coffee blend. Remember that? Anyway, the VIA was good and all but it was not so cheap. Sure, it's cheaper than forking over the $3 something for a small latte, but not quite was I needed to be spending every day. Jump forward to Christmas. My mom, with the best memory ever, surprised me with my very own Toddy! 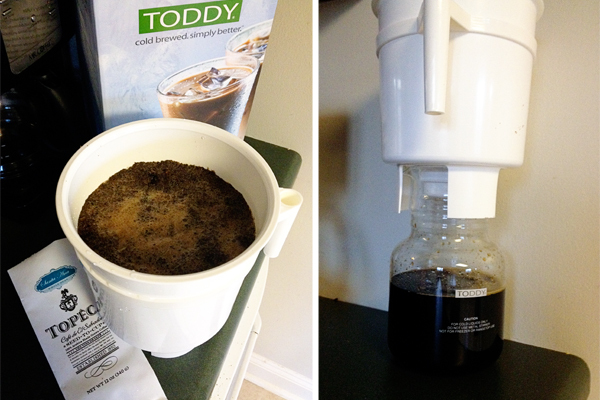 I decided I would try my personal cold brew system with my favorite coffee, Topeca. To be completely honest, my favorite coffee is Blue Mountain, which comes from Jamaica, but $30 a pound is too rich for my family! Anyway, back to Topeca, if you haven't tried it, go get some, you won't be sorry. Here's how the Toddy works: get your favorite whole coffee beans and grind them on the french press setting - they have to be coarse. Then follow the directions which basically go, add water, add grounds, add water, add remaining grounds and finish with remaining water and let sit at least 12 hours. After it sits, pull out the plug and let your coffee concentrate drip through the filter into the glass and refrigerate up to two weeks. That's it. When you are ready, make your favorite concoction. Mine is 3 oz coffee concentrate, 7 oz. milk and 1 teaspoon vanilla syrup. I could really do whole milk and whipped cream on top but that's a little more calories than this 28 week pregnant lady needs! The coffee is not acidic and my homemade drink tasted identical to the vanilla latte I get at a local coffee shop! My search for the best coffee concentrate is officially over!! So, if you're looking for a Toddy for yourself, or a caffeinated loved one, you can get it off Amazon , hello Prime! P.S. the Amazon link gets you 2 extra filters for free which is awesome. Oh mylanta, I'm so glad I read your post today! I was JUST thinking earlier today while I was enjoying my daily iced VIA that I needed to find a cheaper alternative, making my iced coffee in batches. I'm going to check out this Toddy thing. I'm so excited! And I'll check out the Topeca coffee too. My husband's best friend is one of the best roasters in Houston (Fusion Beans, if you'd like to try it out some time) :) so our immediate group of friends are always looking to try new roasts. Thanks! I came away with a lot from this post. lol! Ah Mecca! I am not a huge fan of flavored tea but I looove their Apricot tea. I just might have to check out this Toddy. I am also too impatient to wait on the coffee to cool down and all that. I just found your blog via Tasha does Tulsa and I love it! As a new Tulsan I will be following your blog closely! Hmmm! Never heard of the Toddy before. I use my Bodum French Press, add grinds and water, leave it in the fridge overnight and press in the morning. If that ever fails me, I might have to try this as I am always in search of the perfect iced coffee. Thanks!